No one objected pcie support itself. But patch quality is another issue. Someone commented that the merge might be slow because pcie support is not urgent. Some people are interested in multi pci buses instead of pcie itself because just 32 (- some) slots is too few. The irusage model is a VM as file server with high end storage. They want many LUs to be attached to host and export them to guest VM. He talked about SPICE. The main part is QXL,virtual display device, and its device driver. It supports multi display and he demoed it. Interesting future TODO is network tunneling for local printing and USB forwarding.USB forwarding is for sharing files on local usb memory. This soundsvery useful. KVM auto test is fork of autotest. It runs 1 VM and runs tests in the VM. At the moment, it isn’t able to create multiple VMs and orchestrate them. Someone suggested to run KVM auto test in KVM. That sound good for nested virtualization. 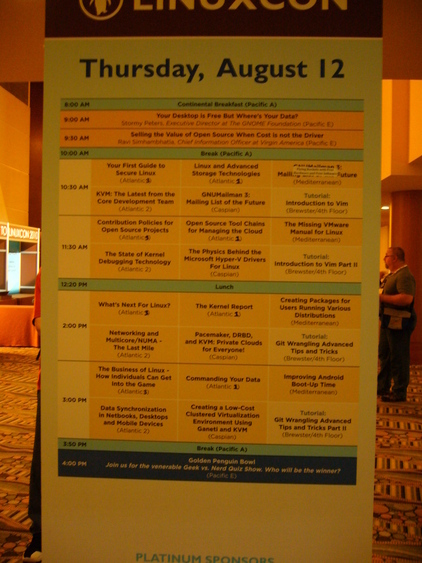 This session should be about threading qemu, but the main theme was splitting maintainer ship. KVM vcpu part is really threaded, but device emulation is single threaded. However the arbitration between KVM(virtualization) and TCG(embedded)is difficult. So he claimed to split out qemu maintainer ship and repository into libqemu-*.so. He explained qemu new device model, qdev. I think it’s been a while since it was introduced so that it is already well understood. Nothing special. This session is about new machine save/load framework called vmstate. It’s much cleaner than old ad-hoc save/load handlers. Live migration is difficult with device/ram hot plug. New part from the last presentation at LCA is benchmark with 256VM. It scaled well with 64 servers. Someone asked about disk scrub. Time is difficult issue to handle. Especially old OSes. The eventual solution is KVM clock(paravirtualize clock). This is about to minimize pinning guest pages. The current IOMMU can’t recover from DMA page fault, so that all guest pages must pinned. To overcome this restriction, paravirtualized guest DMA API. vhost-net is for accelerate network performance by kernelizing data path of virtio. The basic idea sounds very natural and promising. zerocopy and multiqueue are challenging. He talked about pci device assignement. There are many unsoleved issues. 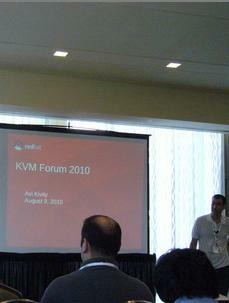 KVM as device driver idea sounded interesting. Future work includes VFIO, PRI and graphics. I’ve heard WinKVM, but this is the first time to watch the presentation. The idea is to use cygwin to create windows driver in PE executable. It sounds very forcible way. This talk is about cpu idle. He showed many power usage measurement result. He introduced recent storage technology and discussed issues realted to them. 4K sector size, discard(SCSI WRITE SAME, SCSI UMAP and ATA TRIM)and data integrity. He tried to improve Android boot up time, but archived no improvement. Discussed many things he tried, but explained why it didn’t work.